ELENCO Snap Circuits® LIGHT SCL-175 <-----175 new projects from the award winning Snap Circuits line! 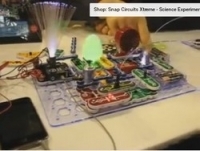 Watch and be amazed at what your music can do with the new Snap Circuits® LIGHTS. Connect your ipod® or any MP3 player and enjoy your music as the lights change to the beat. * Even if you are a Snap Circuits® "Heavy Weight" you will love Snap Circuits® LIGHT!